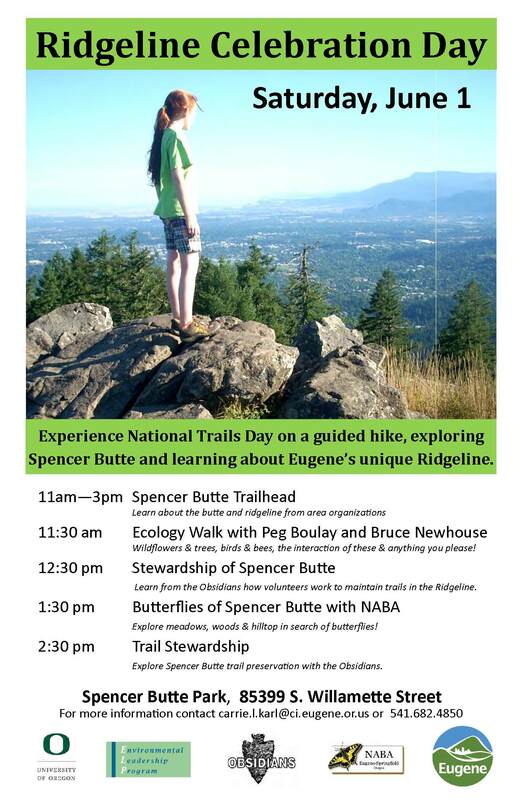 The community is invited to come celebrate Eugene’s much-loved Ridgeline Trail System on National Trails Day this Saturday, June 1 from 11 a.m. to 3 p.m. Join local experts on guided tours of Spencer Butte covering a diversity of topics including birding, ecology, butterflies, trail stewardship and more! Information about partnering organizations will be available at the Spencer Butte parking lot. Eugene’s trails allow us access to the natural world for recreation, education, exploration, solitude, inspiration, and much more. Trails give us a means to support good physical and mental health; they provide us with a chance to breathe fresh air, get our hearts pumping, and escape from our stresses. National Trails Day seeks to highlight the importance of trails and the work thousands of volunteers do each year to care for America’s trails. Trail construction and maintenance takes hours of dedicated planning and labor. Please give thanks to your local volunteers and consider taking a day to give back to your favorite trail. This event is presented by the City of Eugene, Obsidians, Disciples of Dirt, University of Oregon Environmental Leadership Program and North American Butterfly Association. All guided tours and activities begin from the Spencer Butte trailhead located at 85399 S. Willamette Street. Please dress for the weather, wear appropriate shoes and bring water when attending any of the guided tours. Contact: Volunteer Coordinator Carrie Karl at carrie.l.karl@ci.eugene.or.us or 541-682-4850 or Mobile 541-510-4636. May 30, 2013 in Community Events.